I thought it was about time to pay tribute to rapper, singer and actress Dana Owens. Who? Well I knew her as Queen Latifah growing up. To be honest that's still how I think of her when I see her - A QUEEN. Someone who other emcees should bow down to. She didn't just ask for respect, she demanded it, and if you didn't give it OFF WITH YOUR HEAD. She demanded it with her lyrical ability and vocal delivery, and in a genre that was largely male dominated in the 1980's and early 90's (and arguably still is today) nobody could dispute not only her skills but the difference she made in gender equality in and outside hip-hop. That's right - she unapologetically put the "Ladies First" and damn if you don't like it. Queen Latifah wasn't just a pioneer on the mic or on wax - she was a pioneering business woman. She ended up being the focal point of both the Flavor Unit crew and Flavor Unit Management, providing services to successful artists like Black Sheep, Naughty By Nature and Zhane among others. With all of that success in hip-hop as both a performer and an entrepreneur there wasn't much left for her to conquer - so starting with "Set It Off" she launched into a successful career as a Hollywood actress, even receiving an Academy Award nomination in 2002 for her work in "Chicago." That's not what we're celebrating today though - this is a look back at the music videos that represent the way I got to know her first and best - rocking the mic like only she can. 1.) Queen Latifah f/ Monie Love - "Ladies First"
2.) Queen Latifah - "U.N.I.T.Y." 3.) 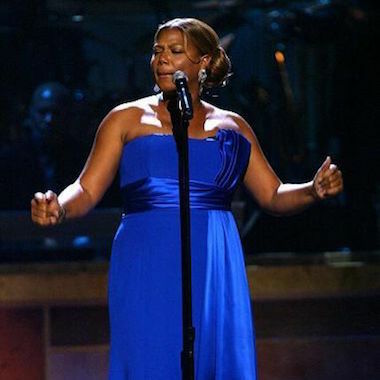 Queen Latifah - "Latifah's Had It Up to Here"
4.) Queen Latifah - "Fly Girl"
5.) Queen Latifah - "Just Another Day"
6.) Queen Latifah - "Come Into My House"
7.) Brandy f/ MC Lyte, Queen Latifah, Yo-Yo - "I Wanna Be Down (Remix)"
8.) Queen Latifah - "Go Head"
9.) Queen Latifah - "Paper"
10.) Queen Latifah f/ Tony Rebel - "Weekend Love"